Resale Rights are somewhat of a confusing topic for many people. Learning how to properly determine the rights that you actually get when you purchase a product with resell rights can be a complete nightmare. In general, there are three major options that the most common types of resale rights and each has its own particular set of rules. Trying to ensure that you get the exact rights that you need is much easier once you actually understand all of the differences. The first set of rights that are used for resell are the master resell rights. These rights are sold to an individual and enables them to turn around and sell the product, to someone else. That would then enable that person to turn around and resell it as well. To make this a bit easier to understand we will assume that Tom created an article. He sold master resell rights to Stella and Steven. Because Stella and Steven had purchased master resell rights they would have the ability to turn around and resell the rights to someone else. The rights that Stella and Steven choose to sell can differ from the rights that they were given. They could choose to sell either master resell rights, or they could instead opt to only sell basic resell rights. Now that we have mentioned basic resell rights, we will take a look at them a moment. If we use the same seller Tom and also the same article, he might choose to sell to someone else as well. However, for a lower fee that was arranged perhaps he decided to only give Tonya basic resell rights. This means that Tonya would not have permission to sell master resell rights to the article. This means that Tonya can sell the article to whomever she pleases, however the people that she sells the article to may not under any circumstances resell the work. This is a very large distinction from master resell rights, which would allow Tonya’s customers to again resell the article. The third choice that is presented is private label rights. Using this method that article that Tom produced he could sell to Michael as a private label rights article. Michael would then have permission to modify the article however he pleased. He could put his own name on the piece and would also be permitted to sell the piece, give it away, sell basic resell rights or even sell master resell rights. He could also opt to use the article on his own website, or include it as part of a book that he was creating. Essentially Michael would be able to use the article in any way he pleased, just as Tom the creator is. As you can see, there are some rather significant differences between the different resale rights. Making absolutely certain that you get what you need is typically pretty easy. If you are working with someone to obtain the pieces you must make sure that you carefully read over all of the terms and conditions for article usage. 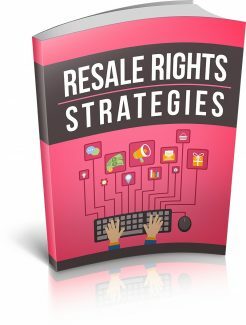 However, these resale rights do not just apply to articles; it could apply to eBooks, reports, software, website templates, graphics and so much more. With all of the different products that can provide a large number of different resell rights it is extremely easy to see how someone can become thoroughly confused. If you find that you are in a position where you are working with several different types of resell rights you will typically find that keeping some detailed records will be quite helpful. This will allow you to determine quickly which products you have private label rights to and can therefore modify however you please. It is also extremely important to be sure you are fully aware of what you can do with the rights, since it could open up new streams of income to you. The Internet has emerged as one of the major ways in which one can make money easily. Though one must always beware of all the spurious sites that crop up from time to time, the Internet if used in a wise manner for earning money can actually prove to be quite an effective tool. This also involves the resale rights of product. This is nothing but a license over the product that you have bought. This license allows you to modify and improvise the product in any way you want to. Ordinarily, if you want to sell a product you will have to place the description and picture of your product and create a good and impressive sale page for it. However with products that have resale rights, you need not do this. You merely have to buy the product with its resale rights and then place it on your website. - Basic Resale Rights: This is the one time resale right, that is to say that the person who buys the product with the basic resale right, cannot in turn sell that product to someone else because that customer loses the resale right on purchasing the product. - Private Label Rights: This basically gives the owner of the product the right to do anything that he or she wishes to do to the product. They can inscribe their name on the product, or make changes to the product. They can keep it with themselves for as long as they want, or sell it for a profit. - Private Label Resell Rights: These type of rights usually give you the source code to the documents that you purchase, such as the Microsoft Word file of an e-book so you can edit the book and rebrand it in any way you wish selling it as your own. Many Internet businesses rely heavily upon such products with a resale rights as a great alternative to spending big money creating their own products. The ownership of such products not only helps you to start your Internet business in a effective manner but also play a major role in building your brand-new Internet business. Once you have the resale rights to a product, you can do whatever you like with that product. In a certain sense, the destiny of that product (and hence of your Internet business) is in your hands.